When people think of Minnesota, the first things to come to mind may be snow and nice folks. While it is true there is a lot of snow and many nice people, it is not all is has to offer. Every year visitors in the millions make their way into Minneapolis to taste its flavors, for its sports and local culture. Once known for its Mississippi River ports and flourmills, Minneapolis is now known for its top tourist attractions in and around the city. Housing a world-class art collection, from contemporary photography to ancient sculptures, the MIA has free public one-hour tours of special exhibitions to permanent collection treasures. Throughout the year, the Guthrie Theatre features three stages, all under one roof offering traditional and non-traditional events and shows. This historic home and museum features Nordic cultural heritage, family events and activities, special exhibits and a landmark tour of the 1908 Turnblad Mansion. Visitors can take in the contemporary and modern art in the Walker Center’s eleven galleries. The Como Park Zoo is one of the few remaining free zoos in America and is open daily year-round. Home to wide range of plants and animals, the zoo is located right next door to Como Town Amusement Park, Como Park and the historic Cafesjian’s carousel. Located minutes outside of Minneapolis, the Como Town Amusement Park is a favorite destination for fun and entertainment. Passengers travel from all corners of the globe to take a ride aboard the floating museum. Public cruises on the historic Steamboat Minnehaha are available from the Museum of Lake Minnetonka. 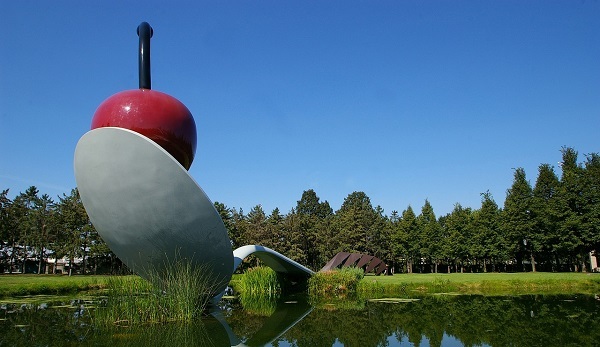 Adjacent to Walker Art Center, visitors can take a stroll through the eleven-acre sculpture garden featuring the iconic 29 ft. long Spoonbridge and Cherry. Take in the majestic Mississippi River and breathtaking views of Minneapolis skyline aboard the Minneapolis Queen. Choose from private or public lunch, Sunday brunch, dinners and wine tasting cruises, while listening to narrations of rich local history. The top 10 most visited Minnesota parks, according to visitor data from 2014. Millions of tourists travel from far and wide to visit Minnesota’s National Parks, some of the best in the United States. Located just 10 minutes or so outside Minneapolis, Mall of America is a top destination for the country’s tourists. Housing over 520 stores, you will find a wide variety of retail shops, restaurants and leading attractions which include the largest indoor theme park in the U.S. as well as LEGO, SEA LIFE Aquarium, Nickelodeon Universe, A.C.E.S. Flight Simulator, and much more. This outlet features 100 designer name-brand stores with upscale collections saving shoppers 25% to 65% off regular store prices. One of Minneapolis’s downtown shopping destinations houses more than twenty unique shops and restaurants. Minnesota has no shortage of delicious food. Experience the unique culinary offering of Minneapolis. From full-service resorts to historic events, and people and places to pristine lakes and tons of wild space; Minneapolis is full of top tourist attractions and something for everyone’s taste for adventure. Minneapolis and St. Paul have many unique and not so well known stories to tell. Most know the region is rich in history and culture; but may not know Minneapolis is one of the biggest little cities in the U.S.
As a Minneapolis DWI Defense Attorney, I am very proud of the area where I live and have my practice. Since I am so proud of this region I wanted to share some of the best attractions for tourists.